Which of these two projects with extremely similar logos was the first to establish their brand under their current logo? As both projects get more attention, this question is getting asked more often. Actually, people often ask the question as Did LBRY copy Stratis? LOL! The answer to that one is no. LBRY was using their logo long before Stratis swapped to their current logo. A quick look at the LBRY Git respositories shows the first time their logo is recorded in one of their projects – in this case, their public website. That file was committed to their repository on the October 9, 2015. They may have had the logo before that, but that’s the earliest I have been able to find it online at present. The LBRY timeline is really easy to establish – the project doesn’t hide things from the public. 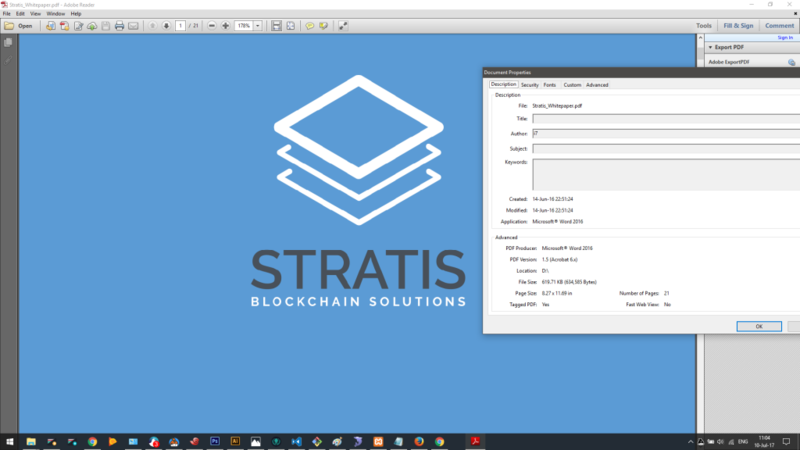 Stratis seems to have under gone a few change of plan upheavals in it’s short life time. This made establishing a timeline for their branding a little harder. I set about looking through the various Stratis Git repositories for any reference to the Stratis logo, and the earliest reference to the current logo I was able to find is a commit on the December 28, 2016. Surely if they were available for trading around the same time LBRY (July 6th, 2016) was, they would have had a logo on the exchanges. Well they did. But prior to 2017, it was a different one: The Internet Archive’s Wayback machine shows that from June 18, 2016 (and possibly earier) to November 28, 2016 (and possibly longer). The Stratis Whitepaper, published on June 14th, 2016 also shows the old logo. LBRY was using their current logo before Stratis created a logo of great similarity for their project. The time-stamped evidence speaks for itself. Since posting this article, I have been provided with information that suggests the original logo used by Stratis was a copy of Google’s Fabric logo (at the time, it could have been Twitter’s Fabric Logo). This blog post shows Fabric using the icon prior to Stratis. How sad in this time and age – with access to all the creative peoples on the interwebs – that Stratis chose to plagiarize LBRY’s logo. Worse, the evidence suggests they have stolen from other projects too!